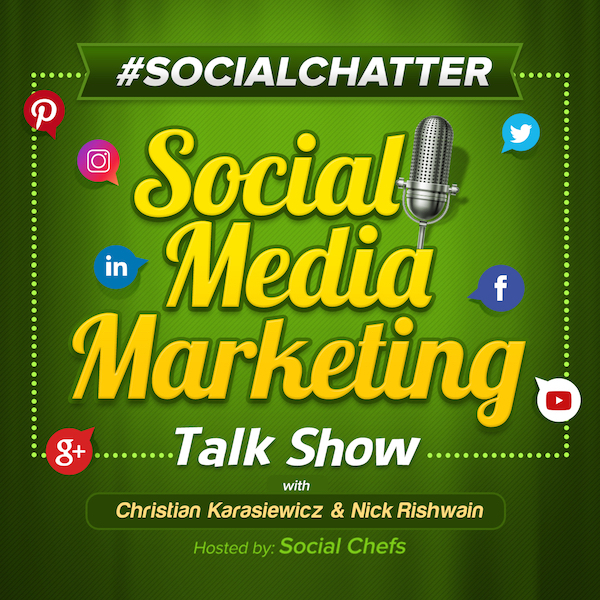 On this week's episode of Social Chatter, your weekly social media marketing talk show, we explore Facebook Premieres for Pages, Instagram Nametag, multiple personas in Facebook Chatbots, LinkedIn integration into Microsoft Outlook and more with Christian Karasiewicz, Phil Gerbyshak and guest, Katie Miller. Let's see what's new in social media this week with your hosts, Christian Karasiewicz and Phil Gerbyshak. In Facebook news, they are rolling out Facebook Premieres for Pages. Facebook Premieres are "a new interactive video format that lets publishers and creators release a pre-recorded video as a live moment." In addition, Facebook is also making two new tools, interactive video polls and top fans so you'll be able to quickly identify the top contributors on your Page. Your business will now have new tools to engage even further with your audience. Premieres will help you schedule pre-recorded video as a live video up to a week in advance. For example, we run our weekly social media marketing talk show called Social Chatter, as a Facebook Live video. We could schedule pre-recorded video about our upcoming live video. You could do the same. If you need a better example of Facebook Premieres, take a look at the following sample video. To read more about Facebook Premieres, along with polls and top fans, click here. Also in Facebook news, Facebook Marketplace is now using artificial intelligence. Instead of guessing on how to price your products in Marketplace, you can now tap into the power of AI to provide price suggestions and help auto-categorize your items. If you wanted to list an item for sale in Facebook Marketplace, AI can help you identify what price range you need to use based on data. This way you can sell your items much faster. Here is a video that shows you how AI in Facebook Marketplace will work. In addition to these new features to help save yourself or your business time, Facebook Marketplace is also adding tools to help detect and remove inappropriate content using AI. Buyers and sellers can also rate one another. If you come across items that shouldn't be on Marketplace, Facebook is now providing more robust tools to report them. Overall, while these seem like small updates, they'll help save you time when buying or selling items in Facebook Marketplace. To read more about artificial intelligence in Facebook Marketplace, click here. This week, Facebook added news ways for you to buy and deliver video ad campaigns. These include in-stream reserve and ThruPlay. According to Facebook, "in-stream ads are delivered as mid-roll in News Feed videos, and either pre-roll or mid-roll in other surfaces including Watch." In-Stream Reserve ads will let advertisers reach people watching videos from "a selection of the most engaging, highest quality publishers and creators." They say these are a good type of Facebook Ad for premium online video and TV buyers. The second type of ad are ThruPlay, which are available for all video placements on Facebook, Instagram and Audience Network. These types of ads are geared towards people who watch 15-second ads in full. Facebook wants to make sure you have enough options to pick from when running Facebook Ads. With these new choices, you'll have to be more strategic when running video ads for your business. Rather than guessing, be sure you are reviewing your metrics each month so that you know how you need to adjust your strategy so that you are reaching the right people. You'll be able to find ThruPlay in Facebook Ads Manager. To read more about these new video ad choices, click here. There was more Facebook news this week. In addition to Facebook Premieres, Facebook is rolling out new comment moderation tools. Instead of deleting comments one-by-one, you'll now be able to hide or delete multiple comments at once from the options menu on a Facebook post. Right now, this will only be accessible via desktop and Android. An iOS version is on the way. In addition, you'll also be able to search for and block offensive words from appearing in comments. Here is a look at the new Facebook comment moderation tool. Do you find that you're overwhelmed with managing Facebook posts? Sometimes you receive comments that need to be hidden or deleted. Often times though, this cam require having to go through each comment individually to delete them. With the new comment moderation tool, you'll be able to hide or delete multiple comments at once. To take things a step further, you'll be able to block offensive words so that they don't appear in comments either. This can be especially useful when posting about political topics. To read more about the new Facebook comment moderation tools, click here. This week, Facebook introduced a new customer chat WordPress plugin to integrate customer chat with WordPress. This new plugin will make it easier for you to chat with your Messenger bot on your WordPress website. The big news though is that you'll soon be able to have multiple personas in Messenger Bots. What this means is that you can create multiple "personas" for your Messenger bots. This way your customers can feel like they're chatting with different individuals in your company instead of a robot. Imagine being able to feel like you're speaking to different people at a company, but you're not - they're bots? Facebook is working on the ability to have multiple personas for Messenger bots. For example, you could chat with a bot for customer support issues, but a live agent when you work with sensitive information. Right now, this is available via the "persona API" for the Messenger platform, but it's a feature that will make it easier for you to discern when you're speaking with a bot versus a live person in Messenger. You can download the Facebook Customer Chat WordPress plugin here (link). To read more about multiple personas in Messenger bots, click here. In LinkedIn news, they are building LinkedIn into Outlook. Microsoft is adding LinkedIn integration into their Office apps. You'll soon be bale to co-author Word documents with LinkedIn contacts or work on an Excel or PowerPoint presentation with coworkers. Microsoft Outlook will soon show contacts in Outlook for your emails and calendar invitations. We've been waiting for Microsoft to integrate LinkedIn into Outlook. What this update will do is force users to use a real email address when communicating with businesses. For your this means improved contact information and better efficiency. No more getting bad email addresses. The people who are truly serious about working with you will finally have a reason to start to use their real email address on their LinkedIn profile. Overall, this should also help you better identify who you might want to work with - the person whose LinkedIn account doesn't show up in your Outlook contacts or the one who does and is actively managing their account? To read more about LinkedIn integration in Microsoft Outlook click here. In Snapchat news, they are rolling out e-commerce ads for the holidays. These shoppable Snap ads will be available via the self-serve Snap ads buying platform. You'll be able to import your product catalog to create ads from your assets. Here is what these new Snapchat e-commerce ads look like. Here's a look at the different e-commerce ads coming to Snapchat. These include Shoppable Snap Ads or "Collection Ads." You'll be able to feature a collection of products in a single ad. When a user taps on a product, they'll be able to learn more about it. Another type are product catalogs. As we mentioned earlier, you can import your product catalog feeding automatically create Story Ads. With these new types of Snap Ads, Snapchat is also expanding their pixel targeting so that you can track specific actions that customers take on your website. This way you can create more customized audiences for your campaigns. Overall, these new types of Snapchat e-commerce ads should help you reach more of the right customers and sell more products. To read more about Snapchat e-commerce ad options, click here. In Instagram news, you can now create a custom identification card called an Instagram nametags. These name tags can be scanned to help people quickly find your Instagram profile. To use Instagram Nametag, follow these instructions. Alternatively, you can also enter the camera on Instagram and swipe to "scan a nametag." Instagram Nametag can also be shared via text messages or through platforms like Facebook and WhatsApp - just press the arrow at the top right of your Instagram nametag to share it. Here is are screenshots of Instagram Nametag. Do you want to grow your Instagram following? Instead of telling someone to go find you on Instagram, you can now make it easy for them by sending an Instagram Nametag. You can post these throughout your shop, make your lock screen on your mobile device, a picture of your "nametag," or use it as an excuse to network with someone. To get Instagram Nametag, update your Instagram app from your devices AppStore (iOS and Android). You can read more about Instagram Nametag click here. Also in Twitter news, you can now monetize Twitter videos viewed by global audiences. Previously, you could only monetize organic video content on Twitter in your home country feeds. Now, Twitter is letting publishers monetize videos that are viewed by all of your followers, not just those from your home country. This is big news because you can now generate revenue for your business for video content viewed outside of your home country. If you post a lot of video content on Twitter and want to monetize it more, you can read more about monetizing videos on Twitter for global audience views here. The first tool that we have discovered this week is Tasko (web). Tasko is a tool to help you outsource digital tasks. What makes it different is that they use other users to outsource tasks without the need to hire freelancers, manage your projects or perform quality checks. Before freelancers can join Tasko, they have to go through a rigorous selection process. The system then gathers data that include ratings and feedback from people who are part of the Tasko system. When incoming tasks come in, Tasko will automatically match them to available freelancers who have the most relevant skillset and highest reputation. The second tool that we have for you this week is PostMuse (iOS | Android ). PostMuse is a free photo editor makes for Instagram and Instagram Stories. With PostMuse, you can choose from hundreds of templates for your design and then edit them and make them your own. Here is a look at some of the PostMuse designs that are available for you to use. PostMuse is available as a free download from the following link.